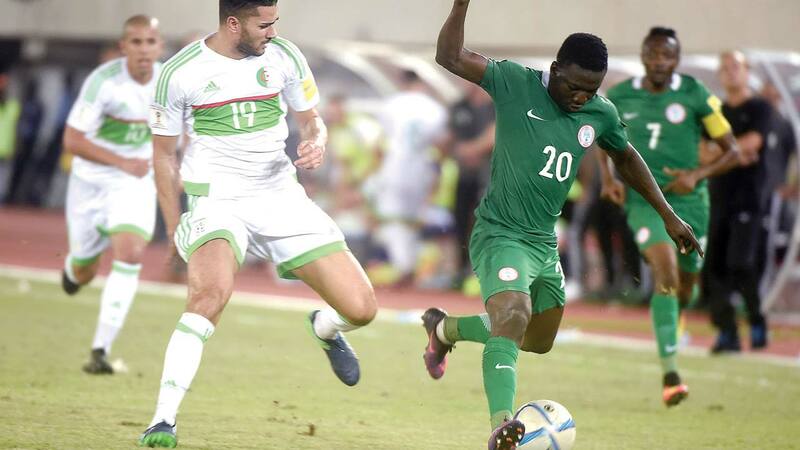 Super Eagles’ Oghenekaro Etebo (right) battles with an Algerian midfielder during their Russia 2018 World Cup qualifier in Uyo. Nigeria will face Senegal and Burkina Faso in preparatory matches in London. PHOTO: AFP. When Nigeria steps onto the Mohamed-Hamlaoui Stadium pitch in Constantine to confront Algeria in their last game of the Russia 2018 World Cup qualifying series, they will have Gabonese referee, Eric Otogo-Castane, as the match arbiter. The game will hold in Constantine on November 10, 2017. According to a release by FIFA at the weekend, the 41-year-old Otogo-Castane would be assisted by M. Aboubacar Doumbouya of Guinea and Seydou Tiama of Burkina Faso, while the fourth referee would be Juste Ephrem Zio of Burkina Faso. Omer Kouamé Dehoulé from Côte d’Ivoire would serve as the match commissioner, while the Referee Inspector is Aden Robleh Rayaleh from Djibouti. Eric Otogo-Castane has been a Fifa referee since 2011 and CAF Elite Referee since November of that year. He was in charge of a match at the 2012 African Cup of Nations, and officiated three times at the 2015 AFCON. Nigeria have already qualified for the World Cup, which means the game on November 10 is just a mere formality. Meanwhile, sports philanthropist, Chief Kessington Adebutu has redeemed his pledge to give the Super Eagles N50 million for qualifying for the Russia 2018 World Cup. Chief Adebutu made the pledge immediately after Nigeria’s 1-0 defeat of Zambia in Uyo on October 7, a victory that qualified the Super Eagles for the 2018 Coupe du Mundo. Presenting the cheque at the weekend to former Ogun State Governor, Chief Segun Osoba, who received it on behalf of the Nigeria Football Federation (NFF), Chief Adebutu said he was moved to donate the money to the national team because they fought hard to make their countrymen proud. The occasion was the final of the Seventh U-20 Boys and Girls Kessington Adebutu Football Tournament held at the Teslim Balogun Stadium, Lagos on Friday.